Thu., April 12, 2018, 9 p.m.
BOISE – A barrel containing radioactive sludge ruptured at an Idaho nuclear facility, federal officials said Thursday, resulting in no injuries and no risk to the public but possibly slowing progress in shipping waste out of the state. The U.S. Department of Energy said the 55-gallon barrel ruptured late Wednesday at the 890-square-mile site that includes the Idaho National Laboratory, one of the nation’s top federal nuclear research labs. The rupture triggered a fire alarm, and three Idaho National Laboratory firefighters extinguished the smoldering barrel and pulled it away from a dozen other barrels nearby. When the firefighters left the building, emergency workers detected a small amount of radioactive material on their skin, said department spokeswoman Danielle Miller. The material was washed off the firefighters, who were taken to a nearby medical facility as a precaution, she said. Initial assessments showed they did not inhale the radioactive material and were not injured, Miller added. None of the radioactive material was detected outside of the building where the rupture occurred, she said. Federal officials said it’s the first known rupture of a barrel containing radioactive sludge at the site but might not be the last. That’s because secretive record-keeping during the Cold War makes it hard for officials to know the exact contents of similar barrels, said Idaho National Laboratory Joint Information Center spokesman Don Miley. The barrel contains a mixture of fluids and solvents that came from nuclear weapons production at the Rocky Flats Plant near Denver. Officials during the Cold War were extremely secretive about the contents of the barrels for fear that the process of making nuclear weapons could be revealed if the contents were known, Miley said. A preliminary theory about the cause of the rupture is that radioactive decay made the barrel heat up and ignite particles of uranium, he said. He said an investigation will try to determine if there are other barrels at risk of rupturing. Workers entering the structure, even before the breach, must use self-contained breathing apparatus and wear full protective clothing. Officials said no radiation has been detected outside the structure, which has special filters to prevent radioactive particles from escaping. It’s not clear how many barrels are in the earthen-floor structure that’s 380 feet long and 165 feet wide. The barrel that ruptured had been moved to the containment structure in preparation for shipment to the Waste Isolation Pilot Plant near Carlsbad, New Mexico. 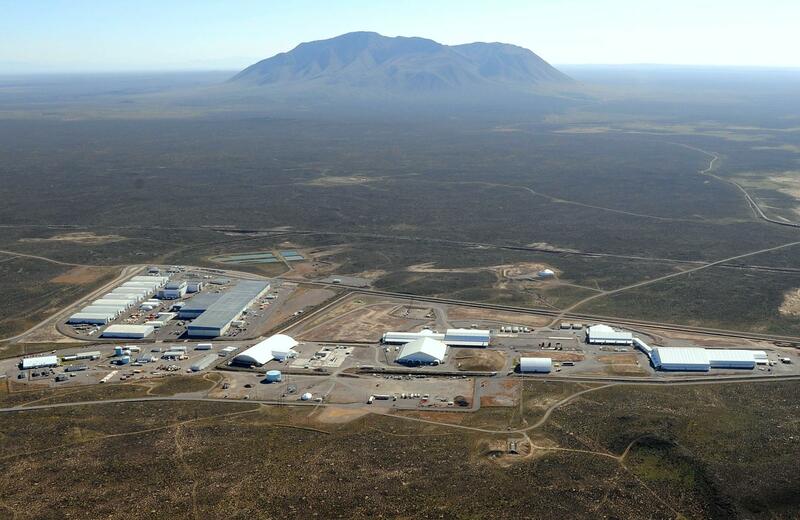 At the underground repository in 2014, a barrel of radioactive waste ruptured after being inappropriately packed at Los Alamos National Laboratory, another of the nation’s nuclear research labs. The waste had been mixed with organic cat litter to absorb moisture, resulting in a chemical reaction. The sprawling Idaho site in high-desert sagebrush steppe sits atop the giant Eastern Snake Plain Aquifer that’s used by cities for drinking water and farmers for irrigation. The area is near the striking 7,550-foot Big Southern Butte, which has a road to the top for adventurous drivers. The site has been used for nuclear waste disposal and storage beginning in the 1950s. The federal government has been cleaning it up following court battles and several agreements with Idaho in the 1990s amid concerns by state officials that Idaho was becoming the nation’s nuclear waste dump. The Energy Department has already missed several deadlines under those agreements involving moving nuclear waste out of Idaho and has paid about $3.5 million in fines. Idaho is also preventing research quantities of spent nuclear fuel from entering the state to be analyzed by Idaho National Laboratory scientists due to a missed deadline. The federal agency also faces deadlines concerning waste stored in barrels, and the radioactive release and investigation could slow the process of moving that waste out of state. The Energy Department has floated the idea of bringing in more nuclear waste from Hanford in Washington state for treatment at a $500 million facility at the Idaho site. Idaho Attorney General Lawrence Wasden on Thursday declined to comment on the situation. Wendy Wilson of the Snake River Alliance, an Idaho-based nuclear watchdog group, said the incident is a reminder of why the state should not allow more nuclear waste to be shipped into Idaho for treatment. “It sure demonstrates how much things can go wrong when you’re dealing with waste that hasn’t been fully assessed,” she said. Published: April 12, 2018, 9 p.m.